Prove tidings of Joy last beyond the holiday season? Quiet and unassuming, Drew Miller is more than just a mail carrier in the small town of Faraday. A typical day on his route includes fetching cats out of trees, changing flat tires, and good-naturedly enduring the pranks of the octogenarian crowd. Unexpectedly, he rescues a lovely young woman in distress. Drew’s convinced she’d never make the tiny community her permanent home, but he’s determined to give her a reason to stay. Among the brightest, happiest memories from Joy Cooke’s childhood are the days she spent with her grandparents in Faraday. When she inherits their home with a stipulation requiring her to live there for six months, she eagerly moves to the mountain town. Then a freak snow storm leaves her at the mercy of the mail carrier, a handsome man she’s spent weeks watching out her office window. Through his steadfast care, she learns the true meaning of giving and selfless love. Can she overcome his reserved, shy manner and claim his heart? 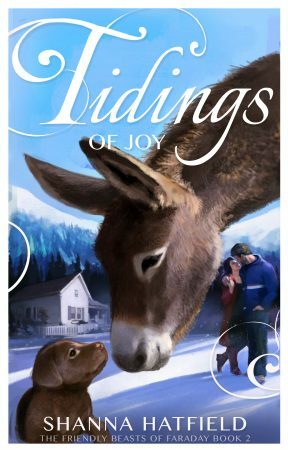 With the help of a donkey named Pete and a puppy named Bacon, anything is possible in this sweet Christmas romance filled with laughter and heartwarming love. Predominately brown, the dog looked like a chocolate lab had eagerly greeted a sweet-talking interloper that snuck under the fence. “What is he?” he asked, unable to hide a smile as the pup licked his fingers and pushed against his hand, wanting more attention. She laughed again and Drew fought the urge to lean forward and press his lips to her very kissable mouth. From a distance, Miss Cooke had appeared pretty in a generic way. Up close, however, she was captivating, stunning, and made his mouth so dry he could barely swallow. Shiny black hair fell in a sleek bob to her shoulders. Eyes the color of sweet molasses twinkled behind thick, dark lashes. A pert nose and flawless skin made him jealous of the guy named Pete. “You, too. I somehow always miss you when you drop off the mail, although Bacon and Pete usually let me know you’re here.” Miss Cooke shivered as she stood in her sock-covered feet on the porch. The wind had picked up and carried a cold bite to it. Miss Cooke took a step forward and pointed to the end of the porch where the front yard fence stretched across the lawn, blocking off the back yard. For the first time, Drew noticed a furry face with long ears peering around the corner over the fence. Apparently the stalker who gave him the creeps on more than one occasion wasn’t a human or even a dog.